The mantra this time of year is one game at a time, don’t get ahead of yourselves, and let history be the guide – still, no team in the NBA has ever come back from a 3-0 deficit. The Philadelphia 76ers are now headed to the parquet-floor-covered house of horrors known as the Boston Garden down 3-1 to the Celtics in their Eastern Conference semifinal series after winning Game 4 to avoid getting swept out of the playoffs despite being favored in every game. After that, they'll have to win another pair, including a Game 7 back in Boston. No chance, right? Well, maybe it’s not as impossible as it seems. Maybe this can be the team that makes history. Maybe this is the series that lands the Sixers in the history books, and launches the franchise into a bright future that starts with a date against LeBron James and the Cleveland Cavaliers. That journey took its first positive step on Monday night as the Sixers rode on the back of T.J. McConnell, who started the game in place of Robert Covington, and finished with 19 points on 9-of-12 shooting while not committing a single turnover. There were a few contentious moments between Joel Embiid and Celtics guard Terry Rozier, but there was never any real drama at the game’s end as the Sixers took care of business. When it was over, there was no confetti, premature or otherwise, from the rafters – a far better decision than the shower of early confetti that quickly turned into a shower of tears after Saturday’s Game 3 meltdown. Even when the Sixers found themselves in that 3-0 hole, it wasn't the usual three-game deficit. Not only could they have won two of those games, they should have won two of those games. 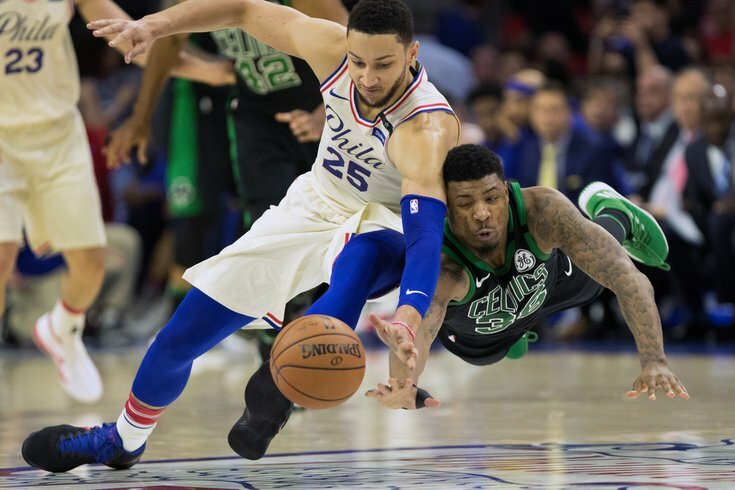 Coach Brett Brown made some bench blunders – and the Sixers players missed more than their fair share of shots while also committing extremely costly turnovers at the worst possible times. So, when the Sixers arrived at the fourth game, Brown replaced Covington in the starting lineup with McConnell. McConnell’s emotion and play led the charge into the Celtics' defensive perimeter. McConnell changed the entire dynamic, and the Sixers found themselves able to penetrate Boston's top-ranked defense. Ironically, what the Sixers got with McConnell is what they were supposed to get with Markelle Fultz, the No. 1 overall draft pick who has been stapled to the bench. However, this week is not about the future of the process. This week is about what could be a historic comeback against a long-established rival. This week is about the Sixers rediscovering what got them to the second round. This week is about throwing a scare into the Celtics. And maybe more than just a scare. From the beginning, this has been no ordinary one-sided affair in terms of the first three games. The Sixers made dramatic blunders, and still managed to be in the games until to very end. The Sixers also had to overcome horrendous games from Ben Simmons, and sub-par performances from Embiid and, of course, Covington who eventually lost his place in the starting lineup. Despite his statistics, Embiid has not yet had an overwhelming game. Embiid can obviously be a game-changer, but in this case he can be a series-changer. He also has gotten under the Celtics skin and it’s guaranteed he will arrive in Boston on Wednesday night with an attitude to put some awful thoughts in the head of the Celtics and their fans. Just imagine a win in Game 5 before the series comes back to Philadelphia. Instead of the thoughts of a sweep that surrounded Game 4, the Celtics would be thinking of their place in history as the first team in NBA history to blow a lead of 3-0. They would also join their housemates the Boston Bruins, who lost a 3-0 lead to the Philadelphia Flyers in 2010. It's almost too sweet to think that after the Philadelphia Eagles knocked off the New England Patriots in the Super Bowl, that another Philadelphia team could stamp a Boston team into the ground with an even more improbable victory. Once again, the Sixers will go into this game as the favorite of the gambling houses. Might be hard to believe, but the so-called smart money has been on the Sixers who have been favored in every game, and will once again be a favorite on Wednesday night in Game 5. The Sixers cleared a huge hurdle on Monday might when they not only avoided a sweep, but also provided a clearer view into their future with McConnell playing the role of what Fultz should do in the future. More immediately, the Sixers avoided the embarrassment of being swept in a series by a team missing two of its biggest pieces. The Sixers team that shows up on that parquet floor on Wednesday night will be a lot different than the nervous bunch that showed up in Boston last week. Believe it or not, after one game, the pressure has shifted to the green team. If the Celtics don’t close this series in five games, the Sixers wave of confidence is going to be very difficult to halt. Believe it or not, despite being down 3-0, the Sixers are very much alive and the expectation here is that they are very capable of making history.